In my Youth some friends took me to a local lake for angling. I can`t really remember what we were fishing for. We sat the whole night in a chair, waiting for a bite that didn`t happened.Think this was the most boring day in my Life! I met my boyfriend Martin some years ago and i guess you can imagine my enthusiasm when he told me the first time that he was going to fish! Because he spent so much time at the water i got curious and asked if i can come with him. We went to a lake and he showed me his flyfishing-tackle and how to use it. After a few hours i managed the chaos with the line , the streamer was landed into the water and it took three strips to my first meter pike. That really knocked me of my feed! Since then i was addicted to Flyfishing and spent nearly every day at the water. I Love to spent time at the coast. The rough sea and the salty smell in the wind gets my mind free. Sleeping in a tent, drinking coffee while watching the sunrise and inhale the fresh air is the best way to start the day. When i stand in the water i feel connected to the nature and enjoy every single second, but one question: did you ever hooked a big and strong seatrout? – I`ll never get tired of that! well, that`s my passion! Can you tell us a little about your home waters and the fish you pursue? I live in the north of Germany, so i have lots of different opportunities to swing my flyrod. It only takes me 1-3 hours driving to the german and danish coast, where i love to go for seatrout. Near to my house i like to spent the end of working days at the ´Este´, a smaller river in which mostly browns are native, but from June to October you can also catch massive searun-browns. Sometimes we drive to the ´Elbe´ and fish from the boat for pike-perch, perch and asp, which is great fun. It also doesn`t take much time to drive to island ´Rügen´, which is known as one of the best pike waters in Europe. What`s the height of the season for you? I like every season of the year. I try to go fishing as long as possible, when it`s getting too cold i like to tie flys at home and enjoy the anticipation about season-start. The hatch in spring and summer is always magical and you can have the best seatrout-fishing in autumn. Fishing for pike in winter ends up my fishing-year perfectly. If i had to decide i would choose the autumn, when temperature falls and seatrouts are getting more and more active. Then you have a good chance to catch big chrome seatrouts and nice searun-browns. What are yout favourite travel destinations? I totally fell in love with Scandinavia! 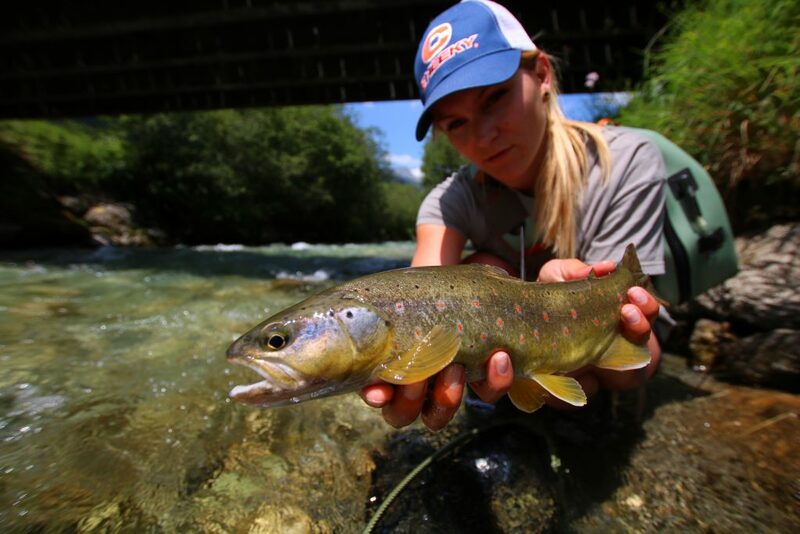 Flyfishing in the breathtaking nature of Denmark, Sweden and Norway is always special, but i like traveling to Austria as well, the gin-clear waters and the beautiful trouts got me. What`s on the bucket list? Oh.. the list is long. I would like to visit Iceland for arctic char and some trout-fishing, Canada for steels, Los Roques for bonefish and GT and definitely i want to flyfish in Patagonia one day. I fish many different waters so i use diverse tackle. For seatrout i use a 6wt or 7wt fast acting rod, depends on the wind. At the river i prefer a 5wt rod and for pike 9wt. What`s your current go-to fly? Mostly i fish for seatrout. Therefor i prefer my self-tied pattegrisen or some brown patterns that imitate pretty much everything and nothing. In my Dryflybox i won`t miss some caddies ,stonefly and mayfly patterns.